March Madness is over, but new data from Millennial Media and the Interactive Advertising Bureau shows just how much of a cross-platform phenomenon the NCAA tournament has become. 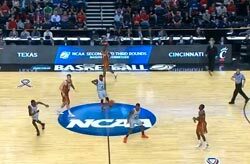 In addition to the broadcasts on CBS and Turner Cable Networks, the March Madness Live platform made all 67 tournament basketball games available live and on-demand across PCs, tablets and smartphones. This year was the first time that wireless coverage of the games was extended beyond Apple’s iOS platform to Android phones. However, viewers in 2012 had to pay a $3.99 fee to watch March Madness games online at NCAA.com or through iOS and Android apps. The study did not break out usage by tablet, but research by comScore said 20% of total online traffic in the first round of the tournament was driven by tablets -- in this case, the iPad. The paywall likely pushed down traffic overall. Multichannel News reported that traffic to the NCAA site during the tournament fell 6% from last year to 51.6 million visits. The site averaged 1.1 million daily visitors, down 10%. Mobile traffic dropped only 1%. The Millennial/IAB study found that 69% of those surveyed used their mobile device while watching the tournament. An equal proportion said the mobile option allowed them to access content conveniently. In addition to watching live games, nearly half of mobile users (48%) checked scores during the tournament, a quarter read about teams or players, 23% checked brackets and 20% watched highlights. Among self-described “passionate fans,” 88% used their devices for March Madness-related activity, and 40% purchased a tournament-related app. Within this same group, more than a quarter (25%) followed the games mainly through their smartphone. In addition, the Millennial/IAB study said impressions on sports apps on the first day of the NCAA tournament increased 31% from the prior week. The increased activity extended beyond sports titles, as impressions on social media apps saw a 42% jump during prime-time games on the first day as tournament chatter heated up. The survey was conducted on behalf of the IAB by Harris Interactive from March 23-27 among 2,220 adults.